Researchers at Georgia Institute of Technology's School of Chemistry and Biochemistry have discovered that an extremely important eye protein is shaped like the letter Y. Many believe this finding will revolutionize how doctors think about treating glaucoma in the future. Georgia Tech researchers spent nearly two years confirming all of their studies on this Y-shaped protein called myocilin (MYOC). Malformed MYOC proteins are often the major cause of hereditary glaucoma. The only other proteins that resemble a Y are antibodies. MYOC is the only single gene sequence that we know of shaped like a Y. With this new data, we now know all MYOC proteins have at least four groups of propellers. Professors believe there are amino acid strings at the top of the Y holding together the top two propellers (aka olfactomedin domains). Study authors also note that MYOC is extremely sticky to work with and quite challenging to look at in the lab. While this finding might not have a direct impact on discovering a cure for hereditary glaucoma, it will help doctors around the world better understand MYOC's function in the body. Believe it or not, nobody in the scientific community knows MYOC's biological purpose. Although doctors can spot the MYOC protein in various parts of the body, they don't know what it does. Ophthalmologists do know, however, what happens when MYOC starts going haywire in a person's eyes. First, MYOC starts producing unfriendly proteins (aka fibrils) that start to damage eye tissues. Eventually, MYOC destroys the trabecular meshwork and increases intraocular pressure (IOP). Over time, MYOC could destroy significant portions of the retina and optic nerve. The particular part of MYOC that causes problems in glaucoma patients is located on one of the olfactomedin domains. This olfactomedin domain at the edge of MYOC is composed of five sharp points with a hole in the center. Raquel Lieberman, a professor of structural biology at Georgia Tech, was the lead author on this study. Lieberman believes that by better understanding what MYOC is doing in the trabecular meshwork we could understand its role in general eye health and glaucoma in particular. 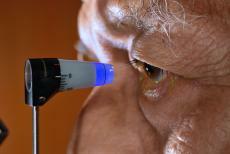 Glaucoma is now the world's second leading cause of blindness. An estimated 60 million people around the globe now have some form of glaucoma. Unfortunately, visual symptoms of glaucoma only appear when the disease has progressed a great deal. Ophthalmologists recommend everyone get eye exams every year to check for glaucoma and other potentially blinding diseases. While there's not cure for glaucoma as of today, doctors can manage symptoms if they catch the disease early enough. The most common methods doctors use to slow the progression of glaucoma include laser surgery and IOP reducing eye drops. The National Eye Institute, the National Science Foundation, and the U.S. Department of Energy Office of Science financed Lieberman's groundbreaking research. This study was published in the October 19th, 2017 publication of Structure. You can find this article under the title, "Structure and Misfolding of the Flexible Tripartite Coiled-Coil Domain of Glaucoma-Associated Myocilin"